Coir erosion control mats are a robust and biodegradable matting designed to provide stabilization and reinforcement on the banks of rivers, hills, trenches, streams, lakes, and ponds. Often constructed from a woven coir twine netting, these mats can be strong enough to stabilize slopes up to 1:1 and flows up to 17 fps. 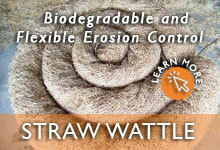 Best of all, each mat uses completely biodegradable fibers that will blend into the environment. Please click on the links below for more information or give our team a call at 1-772-646-0597. 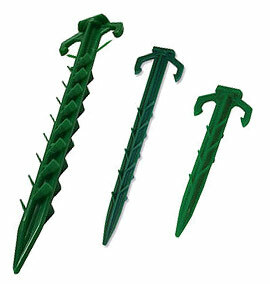 Biodegradable Stakes, staples, and pegs work to fasten erosion mats to the ground. Being made from a plant-based plastic, each product is completely eco-friendly and will biodegrade over time. This eliminates any removal costs, while still offering a product that is as strong and reliable as wood or steel. If you have questions about coir mats, give us a call at 1-772-646-0597 or request a price quote. Choosing the right coir erosion control mat for your location will depend on several different factors including: slope steepness (1:1, 2:1, 3:1), water flow (fps) and desired longevity (temporary, long term, permanent). For our Standard Coir Matting (open weave), models are designed with different strengths to accommodate higher flows or slopes. In addition to the open weave models, coir matting is also available in mesh form with an exterior polypropylene netting. 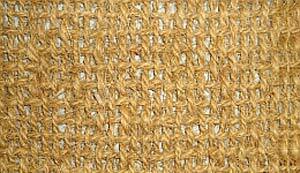 While not as strong as the coir twine material, these mats can be a more economical stabilization option. Coir erosion control mats are one of the strongest available options for stabilizing, strengthening, and controlling sediment in a location. Their ability to support growth in both steep and high flow areas makes them a great choice for a range of different applications. 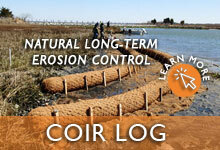 Have a large coir job on the schedule? 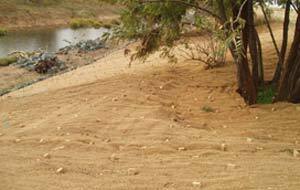 See our Bulk Coir Options. Not sure what the right coir mat is for your location? Give us a call at 1-772-646-0597, we are always happy to work with customers to find the right erosion control matting for your location.